The Form Gallery, Issue #064 - "Organizational Tips for a User-Friendly Office"
Do you need some organizational tips for your office to make it more user-friendly? If yes, then take a few minutes to read the tips below to help save your time and make your life a little easier in the office. There are free banners below for your special church events or even for your very own personal use to download and print. Shepherdbase Special Extended By Popular Demand - Are you finding yourself overwhelmed in the office? Shepherdbase will save you a lot of time in your church office. Shepherdbase - Church Membership Database will track memberships (unlimited), contributions, attendance and much more On Sale Now Through August 31st, 2013 for ONLY $29.99 so Hurry & Enjoy these Savings! Organization is lot easier said than done, but don't let that discourage you. You can start out small by accomplishing one project at a time to help organize your office. Just remember that you will be working towards a goal of making your life easier in the office. Organize To-Do-Lists - If you have a project that you know you will have to do soon don't leave it on your desk because it will get covered up by something just as important. Set up a tickler file (anything that will hold the hanging folders but not too big) with 43 hanging folders, label 31 files "1" through "31" for the days of the month. You can use Avery's big white labels to make your numbers stand out and more visible. Label the remaining 12 folders January through December. Put the numbered folders behind the current month, and as the day passes put that number behind the next month. File any papers that require action in the appropriate folder. You'll never misplace papers again! Organizing File Cabinet - Go through your file cabinet(s) and put away older files or at least de-clutter until a later time. Get five sturdy boxes and label them "Store", "Put Away", "Give Away", "Toss" and "Belongings Here". As you get free time you can go to the boxes and sort through them and you will be clutter-free before you know it! 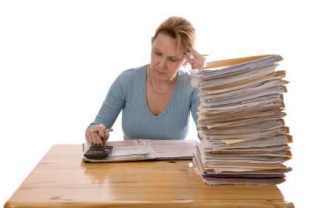 Keep Your Desk Clear - This is very important so you won't be losing your paperwork all the time. Do not keep anything on your desk that you don't use daily. That doesn't mean that you can't keep them close at hand. Keep these important papers in a binder, and put Avery tabs or labels in your binder to easily mark what each daily project is. Use Calendar on PC and/or Sticky Notes - Make sure you don't forget something else by having a calendar on your computer that will remind you of projects, church events, etc. If you don't have a calendar then use sticky notes to make sure you don't forget these very important projects, events, etc. You Need Software - In this day and time they have come up with so many great ways to save your time via software. I'm very fond of Microsoft Office Professional (link below) because they have so many programs that meet all the office needs. MS Office Professional includes Word (professional looking documents/forms), Excel (eye-catching spreadsheets and charts), PowerPoint (impactful presentations), OneNote (organizes notes and information), Outlook (manage calendar and email), Publisher (professional-quality marketing materials), and Access (manages databases like Shepherdbase). Shepherdbase (Church Membership Database) was created in MS Access and will help save your time by tracking church membership information, contribution records, church attendance and much more. Take the first step in organizing your office and believe me you will be glad you did. 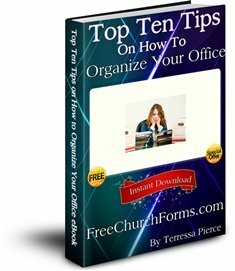 I've been a secretary for my church and other facilities for over 30 years and I can tell you I have learned to use these steps above and use these time-saving programs to not only save my time but it has also allowed me to be more productive and become a great asset to my church. You can click the link below that leads to Amazon's Microsoft Office programs if you need more information. Give Pastor a Plaque - A plaque is a way to show Pastor love and appreciation. I have created a plaque you can print and download below and insert in a beautiful wooden frame. Click Here to download the Free Pastor Appreciation Plaque. Send Pastor Encouraging Letters - On Sunday before Pastor Appreciation Day, hand out stamped envelopes addressed to the Pastor to each church member. Attach a letter to the self-stamped envelope inviting them to write to write and mail a personal note of encouragement and appreciation to the Pastor that week. A hand-written note conveys so much to a Pastor letting them know how much you appreciate them and that you are praying for them. These kind of gifts don't cost much of nothing but is well treasured for many years. "October Pastor Appreciation Month" Banner - It's always special to have a banner up in the church to make sure nobody forgets this month is dedicated to Pastor(s). Click here to download the free "October Pastor Appreciation Month" Banner. Do you need some banner templates to use for your church events or even personal use? If yes, then download and print the Banner Templates below. Click Here to download and print the Banner Templates. Shepherdbase (Church Membership Database) is On Sale By Popular Demand Now Through August 31, 2013 for ONLY $29.99. You will also receive 2 Offering Envelope Templates and Offering Count Sheet free as a Bonus for purchasing Shepherdbase! Hurry and Enjoy these Savings! This great CD has all the free church forms, certificates, flyers...on FreeChurchForms.com along with 4 Bonuses as a Thank You for purchasing the CD all for one special price of $13.99 plus shipping and handling ($7.00 in the U.S. or $27.00 outside the U.S.). The Church Office Package includes Shepherdbase - Church Membership Database and the FCF (Free Church Forms) CD along with all the Free Bonuses for only $40.99 plus shipping and handling ($7.00 in U.S. or $27.00 outside the U.S.)! Hurry and Enjoy these Savings!